Starting to have trouble remember what day it is. 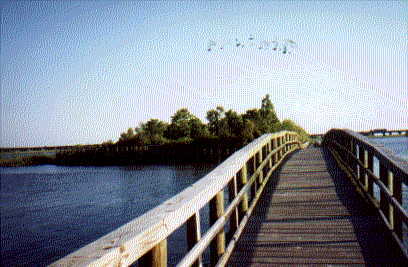 From Spring Hill, Florida--drove 424 miles to Meaher State Park Campground, Spanish Fort, Alabama. I had read that the park did not close until 5pm. I rushed, but when I got there the gate was closed & locked. I was too tired and did not feel like driving any further. Decided to rest for awhile outside the gate hoping someone inside would see me and let me in--or else I was going to drive all night through Mississippi to Louisiana. I surely did not want to do that! 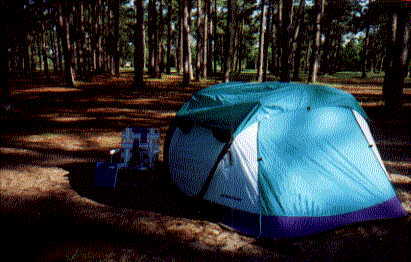 But it's hard to find a place to stay after dark, and it's especially difficult to set up a tent in the dark. Scary too 'cause you don't know what's crawling around. Luckily, someone did see me and let me in. Phew! I could finally set up my tent, relax, write in my journal, and get some sleep. Just like most of the places that I had stayed so far, the park was almost vacant. No tents. Only a couple RV's. The gentleman (who had opened the gate), and his wife (they were the campground hosts) came by on their bicycles while I was setting up the tent. We spoke for a while, and they invited me into their RV for Supper. It was great! We had meatloaf, potato, pepsi, and orange-pineapple cake for desert. I appreciated their company as much as I appreciated their thoughtfulness. We talked and laughed during the meal. Their names were Patsy & Rich. This summer they were hosting the park, but they'd also traveled just about everywhere in their RV. They told me about their travels, and I told them where I had been and where I was headed. I promised to send them a post card from Las Vegas. 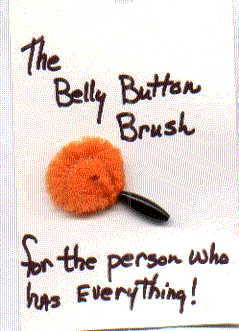 Above: This is the "Belly Button Brush" that Patsy gave me! Above: My tent. I learned what fire ants were that night! Here is a sign that I did not read until after I had set up my tent. 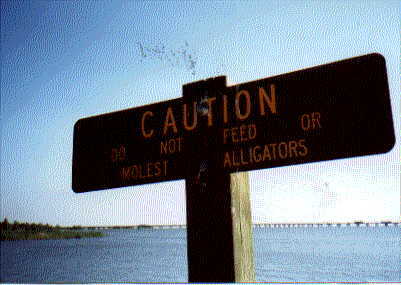 The sign reads: CAUTION; TO NOT FEED OR MOLEST THE ALLIGATORS. But I wasn't afraid that some hungry alligator might crawl up to my tent in the middle of the night and drag me, tent and all, into the water. It had been just last week at one of the live animals shows at Weeki Wachie Park where I had learned that alligators do not attack. However, had the sign read, "crocodile" then I would have been in my car in the next state! But I must admit that as I lay there on my cot that night--the thought did cross my mind that perhaps somewhere out in the murky depths of Mobile Bay lurks the worlds only "predatory alligator" and it had it's sights on my tent!